The Sycamores certainly have the balance and shooting ability to keep the game close—they rank 47th in effective field goal percentage and all five starters spread the shots around equally — but it’s going to take superior execution and a whole lot of grit to actually topple the MVC frontrunners tonight. Gregg Marshall’s club, ranked eighth overall in adjusted defensive efficiency, absolutely dominated Indiana State in their first meeting on January 18, holding the visitors to an ugly 0.79 points per possession and allowing just one player to score over seven points. In fact, the 68-48 final score might not fully indicate just how one-sided it was: The Shockers limited their opponent to four points in the first eight minutes of the second half, including 10 straight missed shots, to help open up a 28-point advantage midway through the period. It was a wire-to-wire thrashing, to be sure, but things should play out very differently this time around. For one, the game is not taking place at the incredibly hostile Roundhouse in Wichita — one of the more difficult venues to play in the entire country. That alone will make for a completely different dynamic. But more importantly, Indiana State is an old team, led by a tough-as-nails point guard and a cast of upperclassmen who would like nothing more than to end a conference foe’s bid for perfection just two weeks after they were embarrassed by them. Wichita State is the unmistakable favorite, without question, but, especially given some travel issues getting to Indiana this week, expect much more of a battle between the Valley’s top two in Terre Haute. Saint Louis (20-2) at Saint Joseph’s (15-6) – 7:00 PM ET, Wednesday. Like Richmond a week ago, Saint Joseph’s has a huge opportunity to boost its at-large profile in the coming days. The Hawks, having just knocked off Dayton and UMass, host the Atlantic 10’s two best teams — Saint Louis and VCU — in a four-day period. One win will be a success; two wins will move Phil Martelli’s club into the conference’s second place spot and perhaps onto the NCAA Tournament bubble. Unfortunately, both opponents feature incredibly tough defenses and do not lose very often. The Billikens, first up, have won 14 in a row after narrowly escaping at home against George Mason on Saturday, which might seem like an encouraging sign of weakness until you consider the following fact: Saint Louis has not lost to Saint Joseph’s since 2006. Keep an eye on this one. Virginia Commonwealth (18-4) at Saint Joseph’s (15-6) – 8:00 PM ET, CBS Sports Network, Saturday. The good news for Saint Joseph’s: Even if it stumbles against Saint Louis tonight, they can still salvage a successful week by beating the Rams on Saturday. The bad news: At 225th in offensive turnover percentage, they don’t exactly do a great job of taking care of the basketball, which is a pretty sizable problem against Shaka Smart’s band of thieves. The Hawks let this game get away from them in Richmond a year ago, so Langston Galloway and company hope their home crowd can assist in exacting revenge on VCU this time around. They have won nine straight in Hagan Arena against conference opponents and look to make it 10 (or 11?) on Saturday night. 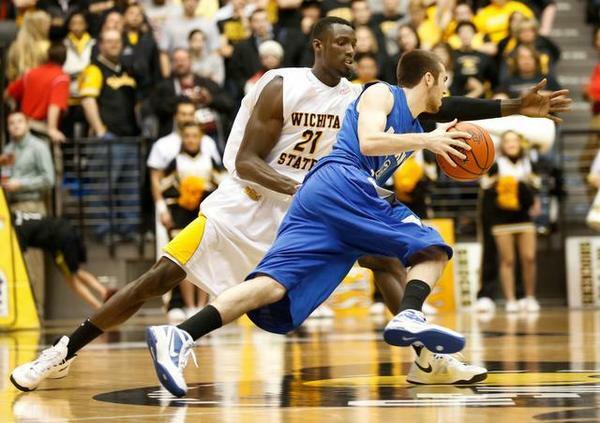 IPFW (18-6) at North Dakota State (16-6) – 5:00 PM ET, Saturday. The first-place Mastodons visit the second-place Bison in a Summit League clash that pits two of the country’s best shooting teams against each other. IPFW — which ranks in the top-20 nationally in both two-point and three-point percentage — outshot NDSU in their first meeting on January 9, going 8-of-17 from deep and taking advantage of almost every trip to the free throw line. The Bison are very tough at home, though, and might have the conference’s two best (and most efficient) players in Taylor Braun and Marshall Bjorklund. This game will feature some sharp offensive execution and two teams that really want a first round bye in the league tournament. Murray State (13-8) at Belmont (17-8) – 9:00 PM ET, ESPNU, Thursday. Okay, so neither team is quite as good as they have been in recent years and Belmont might prove too tough at home, but this match-up has “budding rivalry” written all over it. Both programs have been among the most successful mid-majors across America in recent years, combining for 238 wins — exactly 119 apiece — and five NCAA Tournament appearances since 2010. Last season, the Bruins’ first in the Ohio Valley, produced two nail-biters each decided by five points or fewer, the first being a Murray State victory in which a huge Belmont rally came up short, the second being an overtime thriller in the conference championship game that saw Kerron Johnson break the Racers’ hearts. This year’s regular season iteration is also important — both squads currently sit atop their respective OVC divisions — and we can only hope it generates near the same kind of drama it did in 2013. San Diego State (19-1) at Boise State (15-7) – 9:15 PM ET, CBS Sports Network, Wednesday. The Broncos have already dropped four Mountain West games this season — disappointing, by most measures — so a date with San Diego State, winners of 18 in a row, might not seem like fertile grounds for an upset. But upon closer inspection you will discover that three of the four losses were by four or fewer points, including a three-point road defeat against the Aztecs. Furthermore, Boise State has been one of the unluckier teams in the country this year (evidenced by the close losses), while Steve Fisher’s club, as good as they have been, comes in ranked 13th luckiest, according to KenPom. 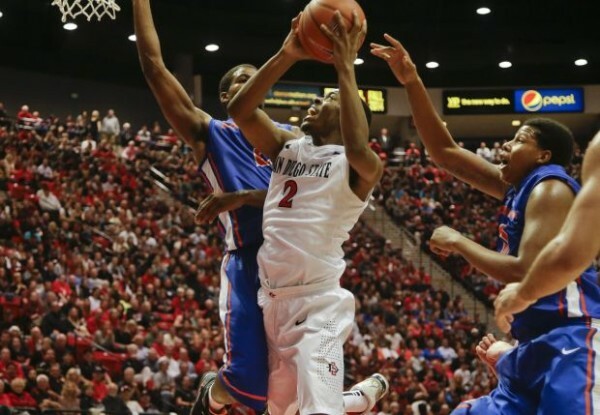 And while some of that may be the result of San Diego State’s suffocating defense and players making key plays in critical moments, it also tells me that the Aztecs are bound to get nipped at some point in conference play, especially in a league with a few NCAA Tournament-caliber teams. So why not the Broncos, a veteran club with a stellar backcourt playing in their home arena? Don’t be surprised if another top-five team goes down on Wednesday night. UC Santa Barbara’s Alan Williams and Hawaii’s Isaac Fotu – 12:00 AM ET, Thursday. Williams is a multi-skilled beast fresh off a 26-point, 20-rebound outing against UC Davis last week. Fotu is averaging more than 20 points per game over his last five. Both are slightly-undersized (6’7’’ and 6’8’’, respectively) yet hugely-effective big men who have been integral pieces on Big West contenders. They will body up on Thursday night in a game that could help decide the eventual conference champion. Manhattan’s Michael Alvarado and Canisius’ Billy Baron – 7:00 PM ET, ESPNU, Friday. It will be interesting to see what Billy the Kid does against the MAAC’s best defensive unit and a player in Alvarado who had seven steals in one game earlier this season. More than likely, Baron will score points, because that’s what he does, but they might not always come easy and he might not be able to stop Alvarado’s aggressive penetration on the other end of the floor. Either way, Baron is must-watch television and this game just happens to be one of the more important league contests around. Brown’s Sean McGonagill and Harvard’s Welsey Saunders – 7:00 PM ET, Friday. McGonagill is a lights-out three point shooter capable of erupting for huge scoring nights when he gets hot, and that might be necessary if Brown plans on competing with the heavily-favored Crimson on Friday night. Unfortunately for the Bears, Wesley Saunders is one of the best perimeter defenders in the conference. He’s also among the most dynamic players on the offensive end, which is to say he’s a superb all-around basketball player. Harvard will likely win the game, but crazier things have happened on a Friday night in the Ivy League. Whatever the outcome, McGonagill and Saunders should have a lot to do with it. This entry was posted on Wednesday, February 5th, 2014 at 1:15 pm by Tommy Lemoine	and is filed under microsites, other 26. Tagged: alan williams, atlantic 10, belmont, billy baron, boise state, feature, greg lansing, hawaii, indiana state, ipfw, Isaac Fotu, ivy league, jake odum, kenpom, maac, missouri valley conference, mountain west, murray state, north dakota state, northern iowa, ohio valley conference, saint joseph's, saint louis, san diego state, summit league, vcu, wesley saunders, wichita state. You can follow any responses to this entry through the RSS 2.0 feed. You can leave a response, or trackback from your own site.